via Boingboing via IZ reloaded comes this photoset from flickr of some great old Penguin paperback covers. 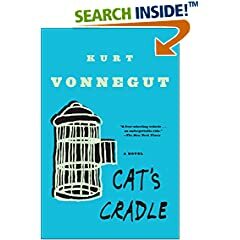 It reminds me of what they did to the Kurt Vonnegut covers, replacing the charming illustrations with a graphic V and title. Spotted in Teleread during the lunch hour was this little snippet from Business week about Kurt Vonnegut, Slaughterhouse-Five, and Wowio. Just something to tuck away for a later date when you're asked what you think of Wowio. If you are ever asked what you think of Wowio, which at the rate they're going will probably be never. So how about that Sony Reader? Anyone? Anyone? Anyone?